The Fairchild Republic A-10 Thunderbolt II is an American twin-engine, straight-wing jet aircraft developed by Fairchild-Republic in the early 1970s. It is the only United States Air Force production aircraft designed solely for close air support, including attacking tanks, armored vehicles, and other ground targets with limited air defenses. 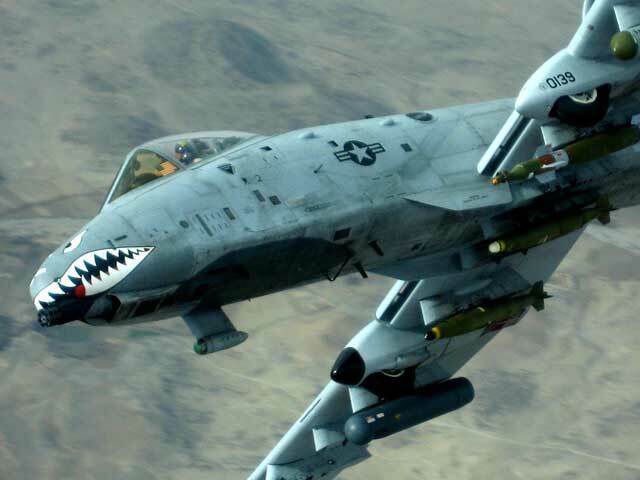 The A-10 was designed around the 30 mm GAU-8 Avenger rotary cannon that is its primary armament and the heaviest automatic cannon mounted on an aircraft. The A-10's airframe was designed for durability, with measures such as 1,200 pounds (540 kg) of titanium armor to protect the cockpit and aircraft systems, enabling it to absorb a significant amount of damage and continue flying. The A-10A single-seat variant was the only version built, though one A-10A was converted to an A-10B twin-seat version. In 2005, a program was begun to upgrade remaining A-10A aircraft to the A-10C configuration.